It was with affection and excited expectation that I began Neil Oliver's The Vikings, after being utterly charmed by his previous work, A History of Ancient Britain. I was looking forward to Oliver's personality shining through the history, his sometimes funny and always emotional descriptions of artifacts and other historical remnants, and his odd and interesting adventures following the footsteps of his historical quarry. And after finishing The Vikings, I can honestly say that I was not disappointed one bit. Oliver's historical story-telling is very unique and highly enjoyable. 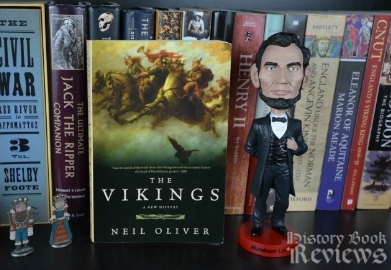 He weaves together his narratives with strands of literary, archaeological, linguistic, historical, and genetic evidence, accompanied by highlights of his own adventures and experiences, as he actually travels to many places associated with the Vikings during his research (how do I get this job???) and participates in many bizarre and fascinating experimental archaeological exploits to find a deeper understanding of the Viking experience. I have grown to love his writing style, which so obviously screams out his awe, fascination, and reverence of the history he seeks, unashamed of his emotional reactions to the objects and remains that are left behind. While his facts are sound and his history is well-told and educational, it is his passion that makes this book such a treasure to read. The book opens with a lengthy and somewhat inexplicable description of sea eagles. I normally would have been irritated by this, but after reading Oliver's other book and knowing his style, it just had me affectionately rolling my eyes and wondering where he was leading me. He proceeds to describe Scandinavia's progress through the Mesolithic, Neolithic, Bronze, and Iron ages as a context for the emergent Vikings in later years, and this is just as exciting as the Vikings themselves. Oliver's power of description never fails to make me smile, whether he is comparing a corpse of a Bronze Age teenage boy with a member of a 21st century boy band, recounting his incredible but uncomfortable "Bronze Age Night" spent in a recreation hut alone on his 45th birthday, or blaming the Vikings' murderous attack on Lindisfarne on a bad mood due to a particularly rough sea crossing. 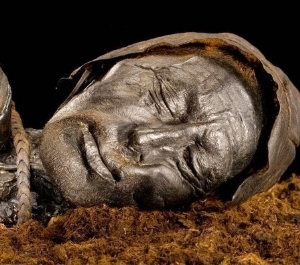 My favorite moment was his encounter with a partially decomposed, yet remarkably preserved, bog body from the Bronze Age, which he called "beautiful". That adjective probably wouldn't have been the first to come to MY mind, but I find Oliver's respect and appreciation of the ancient dead very touching. Oliver covers the period of the Viking Age through explorations of the Northmen in their homes of Scandinavia, but also extensively in their travels and colonization of other areas including England, France, Ireland, Russia, Iceland, Greenland, and the Orkney and Shetland Islands. He uses examples of archaeological finds, skeletal pathology examinations, linguistic evaluations, and genetic evidence to come as close to the people we call "Vikings" as possible, and his yearning to understand them (and portray them) as humans is admirable. He pays heartbreaking tribute to long-dead skeletons with a great deal of respect and sensitivity, imagining them as they were in life. He uses humor to gently tease long-dead men for leaving rather shocking and slightly pornographic runic inscriptions carved on walls of stone, along with some crudely drawn illustrations. He defies readers to visit the island of Lindisfarne (the site of the first documented Viking attack on England) and not feel a deep sense of peace. Myself I felt more of a wild ecstasy when I was there, hobbling through the ruins on my broken foot, but I see what he was getting at. Oliver's writing can verge on the ridiculously dramatic (case in point: "These were Vikings, and their cargo was Hell on Earth"), but it is always entertaining and genuinely adoring of the past. Besides exploring the history itself, he includes some discussion of the present and the effect that the Viking Age had upon us, tying that history to some interesting current events such as the potential divorce of Scotland from England. He writes thoughtfully about the adoption and spread of Christianity by the Scandinavian people, and examines the political component of religion in this time period with perceptive insight. He even describes, to my great amusement, his sampling of traditional Icelandic food, which was most likely also eaten by the Vikings. I laughed out loud when he described a dish of fermented shark meat as "a French kiss with the living dead", and at his assertion that the brine-pickled herring was rated by Japanese scientists as having the most putrid smell in the world. It must have been a slow month for science in Japan. Overall, The Vikings by Neil Oliver is a treat to read. As the reader, I was taken all over the world with the author in his quest to understand the Vikings, and I felt like I was part of his adventure. I very much appreciated his sensitivity and true passion for his subject, as he struggled to connect with the Vikings beyond the stereotypical image of them as bloodthirsty barbarians wearing horned helmets (and I loved him for emphasizing that the Vikings NEVER WORE HORNED HELMETS). Instead he paints a picture of them as travelers and colonizers, warriors and engineers, mercenaries and bodyguards, husbands and wives, loving children and grieving widows. Oliver is wildly successful at bringing the Vikings to life as real people and transmitting an infectious fascination for them, and I think anyone interested in this topic will find The Vikings something really quite special. The Silverdale Hoard, found in England. In 1802 a Viking hoard was found on Hare Island in Ireland that is still considered the richest collection of Viking gold jewelry ever found. It contained ten golden arm rings, as well as many silver rings and ingots, and altogether it weighed over 11 pounds. Tragically, this magnificent and important historical treasure was MELTED DOWN AND REWORKED by a jeweler within a decade of the discovery, and is only known of today by a few drawings made of the contents before its destruction. Luckily in this day and age artifacts and archaeological sites are treated with much more respect, but I hope that this example highlights the importance of continued preservation and the devastating loss of archaeological evidence that we do not want repeated in the future. I also hope there is a special place in hell for that jeweler.